The randomizevs function scrambles the order of values in a value set. 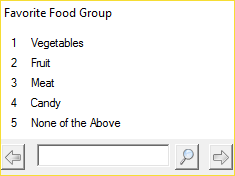 The function is useful when using extended controls in a data entry application. 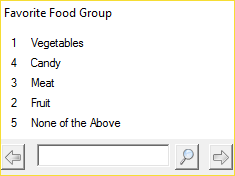 Some survey applications choose to display the possible response categories in a randomized way so as to minimize an enumerator or respondent's selection bias. The dictionary_symbol may be the name of a value set, item, group, form, or an entire dictionary. If randomizing the value set for an item, an optional exclusion list, exclude_code1, ..., exclude_codeN, allows you to prevent certain values from being given a random order. This is useful for variables like Don't Know, which, after the randomization, would remain at the bottom of the list of values. The function returns the number of items for which the value sets were successfully randomized.